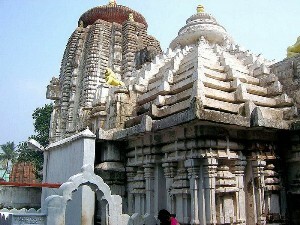 Dedicated to Lord Shiva (Kedareswar) and Goddess Gouri, the temple is situated within the same premises next to the Mukteswar Temple. Beside of the temple subsists a perennial stream. According to Kapila Samhita a single sip of water from the tank absolves the drinker from the repeated cycles of birth and death. The legend goes that king Lalatendu Kesari, after a tragic episode relating to two lovers Kedar and Gouri, had built this temple in their memory. Near the temple there is a `Khirakunda` and another Marichi Kunda`. The water of Khira Kinda is considered hygienic and digestive for which it is carried to different places for drinking purpose. The water of Marichi Kunda is auctioned on Asokastami day and consumed by sterile women who want to conceive.